Join in one of many exciting NSS or NSS-sponsored contests! You can sign up to participate in a currently active contest below. This annual space settlement design contest for 6-12th grade students has been sponsored by NASA Ames Research Center from 1994-2018, for the last several years in conjunction with the National Space Society. 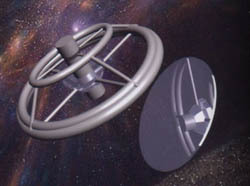 A Space Act Agreement between NASA and NSS is currently being worked on to continue joint sponsorship of the contest. Meanwhile, the 2019 contest is being sponsored by NSS. The single highest scoring team or individual attending ISDC will receive the Herman Rubin Award for $5,000. This annual contest puts high school students in the shoes of aerospace industry engineers designing a city in space that will house over 10,000 people. 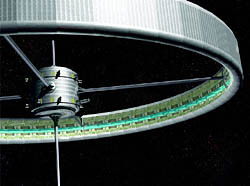 Student engineers demonstrate creativity, technical competence, management skills, environmental knowledge, space, teamwork, and presentation techniques to conquer the problems inherent in siting and designing a Space Settlement (Space Colony). What is LEO? LEO stands for Low Earth Orbit and is a region of space located between 150 and 2000 km (99 and 1200 miles) above Earth’s surface. Learn about, imagine & share the exciting LEO environment as a professional engineer, designer, advertiser, writer, or artist that has been hired to create promotional materials about LEO and its environment. 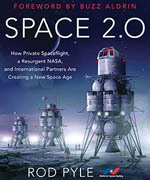 This contest sponsored by the National Space Society’s Enterprise In Space program invites students like you to participate. 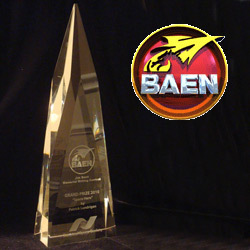 The Jim Baen Memorial Writing Contest has been co-sponsored by NSS and Baen Books since 2007. 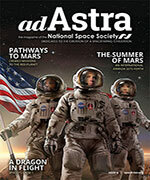 Science fiction writers who create positive stories about man’s future in space are rewarded with professional publication, NSS membership, and an award presented each year at the ISDC. Winning entries aren’t pulp tales about galactic empires or alien abductions, but serious near future stories about the sacrifice, heroics, adventure and discovery with our expansion into the solar system. Note that the contest opens on October 1st of each year, and is closed for submissions on February 1st of the following year.